All I could think about last week was fresh, chewy, crusty bread. The only reason I waited until the weekend was so I wouldn’t have to compromise on what I wanted. So on Friday evening, I pulled out The Bread Baker’s Apprentice to see what new bread I could make that would satisfy me. I found a recipe that I’ve always wanted to make but put off, knowing that often bread will play second fiddle to soup or stew or whatever they might accompany. This week, however, I just wanted to eat really good bread. It was finally time for me to make Pain a l’Ancienne for Bread Week 14. This was the most delicious bread I’ve ever made, and is one of the easiest, if not the easiest, yeast bread recipe I’ve ever made. The bread takes minimal shaping and only one (long) rise. Simply make your dough, refrigerate overnight, let rise a little the next day, shape, and bake. You can hardly make a yeast bread more simply than that. This bread was amazing. The bread was very flavorful and delicious. It had great texture, with even crumb. The inside was chewy but not tough. 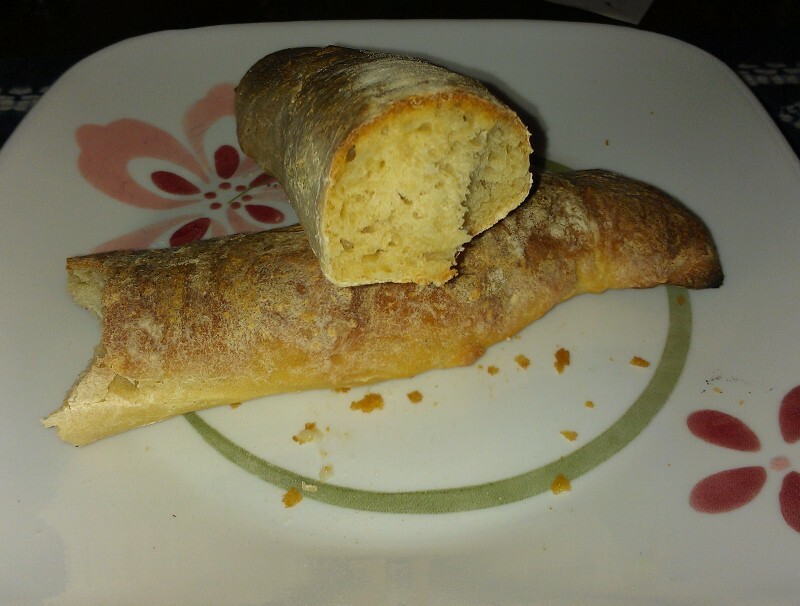 I loved the crunch of the crust of the baguettes. I cheerfully ate the baguettes on their own, without any accompaniment, but they were also excellent with good olive oil. 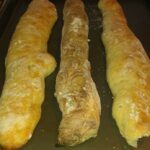 The ciabatta was also nice, but it did not have the crisp crust that the baguettes had, due to the lower baking temperature. I turned it into very delicious garlic bread. Also amazing is how easy this was to make. Sure, I say that most of the things I make are easy, and yes, it’s still yeast bread so it will take some time. For a crusty bread, though, this was pretty simple. This bread took very little hands-on preparation. You have to make the dough the evening before, but after that, you wait until it’s doubled, and that’s it! Just cut, stretch and shape, and bake. There’s no rolling the dough, trying to get the tension right on the outside so that the bread holds its shape. This may become my go-to bread recipe, as long as I plan ahead by a day. It’s that good. You should try it. This incredibly easy lean bread recipe comes from Peter Reinhart's The Bread Baker's Apprentice. Combine flour, salt, yeast, and lesser amount of water in bowl of stand mixer. Beat with paddle attachment on low for 2 minutes. Replace the paddle with the dough hook, and beat for another 5-6 minutes on medium speed. The dough will stick to the bottom but should clear the sides of the bowl. If the dough is too dry, add more water, bit by bit, while mixing until the dough reaches this consistently; you want a slack dough. Oil a large bowl and scrape dough into it; grease the top of the dough and cover with plastic wrap. Immediately place the bowl in the fridge and refrigerate overnight. The dough will have risen some overnight. Pull the bowl from the fridge and let rise until the dough has doubled from its original (pre-refrigeration) size. This may take 2-4 hours, depending on your room temperature; it was cold so this took 4 for me. Gently transfer the dough to a well-floured surface. Try not to degas the dough. Flour the dough and gently stretch it to an 8×6 rectangle or oval. Use a dough or bench scraper dipped in water to cut the dough in half width-wise. Let the dough rest briefly (about 5 minutes) while you line 2 baking sheets with parchment and coat them with cornmeal. Preheat your oven to 500F and place a metal baking pan on the bottom oven rack to preheat (for making steam). To shape the dough, cut each half into 3 equal sized strips. Carefully transfer each strip to the baking sheet and pull it to the length of the sheet. Stretch it out again if it springs back. Slash the top of each loaf (if you can – the dough is sticky). Place one pan on the top rack of the oven. Add 1 cup hot water to the preheated pan to create steam. After 30 seconds, carefully spray water into the oven to create more steam. Repeat 2 more times. Reduce oven temperature to 475F. Bake 18-25 minutes, until bread is a darkish golden brown and the internal temperature is 205F. Preheat oven to 500F again before baking your second sheet of bread. While you bake your first pan of bread, spray your other loaves with oil and cover with plastic wrap while you wait to bake them. Refrigerate if you’d like to bake them the next day. 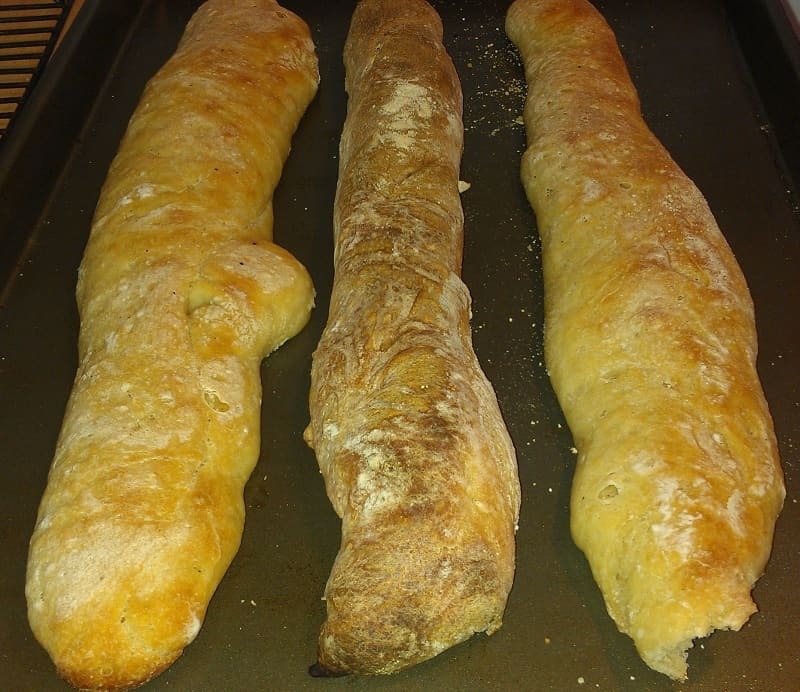 Let the dough rise unrefrigerated for 1-2 hours if you’d like to make ciabatta-style bread instead of baguettes. Bake the bread the same way, except reduce the temperature to 450F after steaming. Bake for 15-20 minutes. This sounds good, and perhaps easy enough for me. Can it be made in wider freeform loaves or in bread pans? Can you cook more than 1 at a time? If you tried it in loaf pans, you should grease the pans well or line them with parchment for easy removal. You could also make it in 2 loafs instead, but bake time would take longer – I’m not sure how much. I had 3 loafs per pan, so I only had to bake twice. You might be able to bake both pans at once if you could have the steam pan on the bottom of your oven.